I’m baaaaaaack and I missed you! I’m currently suffering from Empty Nest Syndrome since my family left yesterday. Luckily, the Bachelorette and some leftover wine consoled me last night. Saturday night, I threw a ‘Build your own pizza party’ with my family. Initially, I was worried that the pizza wouldn’t turn out and everyone would be disappointed, but my worries vanished as soon I saw the beautiful pizzas come out of the oven and the kids faces light up! If you followed my Project Food Blog journey last year, you may know that I used to be terrified to make my own pizza dough crust from scratch. Actually, any type of bread baking involving yeast terrified me for years! I stuck to buying pre-made crusts at the grocery store. It was only when I was faced with Project Food Blog’s Pizza Challenge, that I had to face my pizza dough fears and dive right in. That night, I tried out 5-6 pizza dough recipes right there in my kitchen with a bottle of wine. It was fabulous. I created all kinds of flavours like herb and cheeze, chocolate, and cinnamon sugar. Most of them tasted horrible, but I was learning! After 10 trials of pizza dough, I finally conquered my pizza dough fear and I discovered that sometimes you just have to get flour in your keyboard, dough stuck in your hair, and polish off a bottle of wine until you find your groove. it’s a life mantra, really. After talking with my family this weekend, I discovered that so many of us have this same fear about making pizza dough from scratch. Today, I’m going to show you step by step how to make the pizza dough of your dreams! I’ll wait here for a second while you get your apron on and pour yourself some wine. Recipe –> For my whole wheat pizza dough recipe, I used this ‘Amazing Whole Wheat Pizza Crust’ by Marla on Allrecipes.com. It is rated 4.5/5 stars by 578 users! It’s my fav! 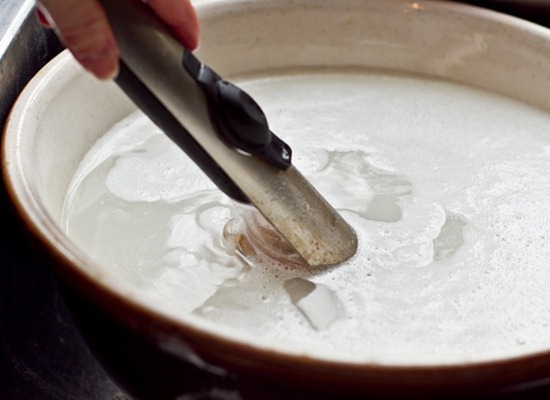 In a large bowl, dissolve 1 teaspoon of white sugar in 1 and 1/2 cups warm water (about 45C/110F). Stir until dissolved. 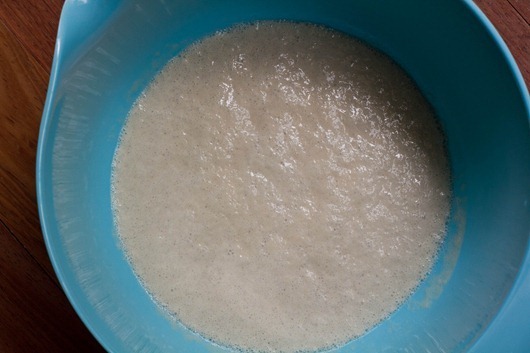 Now sprinkle 1 tablespoon dry active yeast on top of the sugar-water mixture and let stand until foamy, for 8-10 minutes. 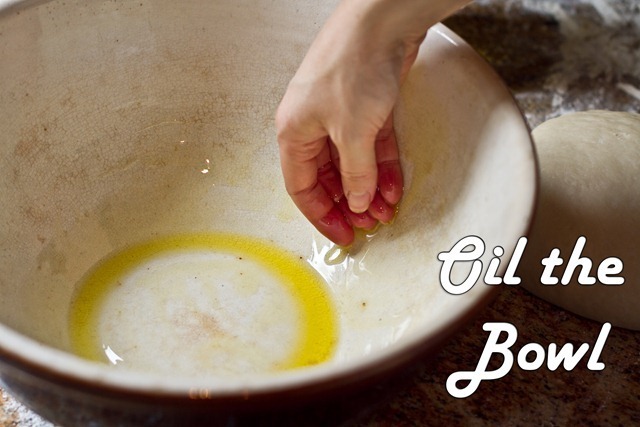 Add 1 tablespoon olive oil into the yeast mixture and gently stir. Now, mix in 2 cups of whole wheat flour and 1 cup of all-purpose flour and stir until the dough starts to come together. The dough will be very cracked and scruffy looking at this point and this is totally NORMAL! Do not fear!! 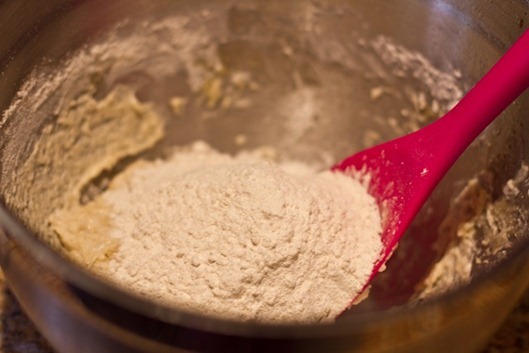 Add the remaining 1/2 cup of all-purpose flour onto the counter and place dough on top. 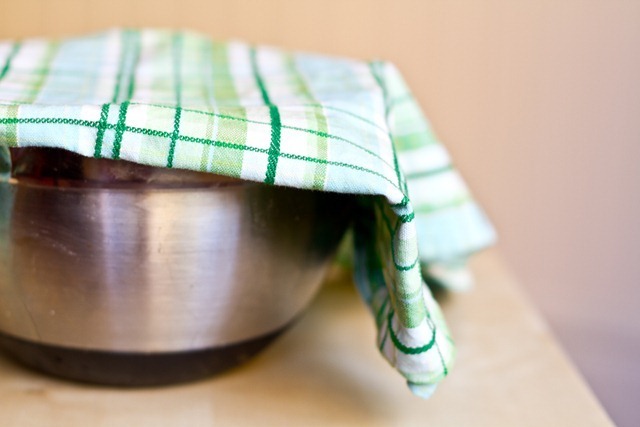 Tip: At this point, soak your bowl in soap and warm water for easy rinsing later! Now it’s time to knead the dough (for a great video tutorial, see here) until all of the flour has been absorbed and the ball of dough becomes very smooth and non-tacky. This is the point when you will feel like you did something horribly wrong because your dough looks like crap! But, trust me, it will eventually come together in 8-10 minutes of kneading!!! It really does take the full 8-10 minutes until it comes together. Shape into a ball. Once you make a few pizza doughs, you will know exactly when it’s ready. And yes, kneading dough by hand is a workout, but we’ve never been afraid of a little work, right? I tried a few pizza doughs with my KitchenAid stand mixer dough hook last Fall and they never came out as good as kneading by hand. 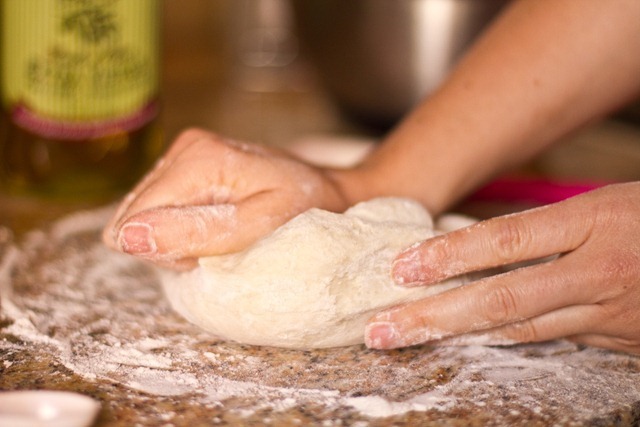 There’s a reason why pizzerias still knead dough by hand! 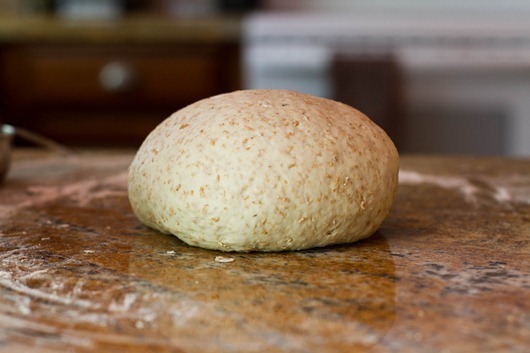 5) Admire your beautiful ball of dough that you worked so hard on! Rinse bowl and lightly oil it. Place dough ball in the bowl and lightly move it around to coat the ball with oil. This will prevent it from sticking to the bowl as it rises. Place dough in the bowl and cover with a towel. Let it rise until it’s doubled in size, about 1 hour. In the summer, I just leave the dough on the counter, but if it’s cold, you might want to place it in the oven (NOT turned on) with the light on to keep it warm. After rising, punch out the air. Divide dough into two balls (for 2 thin crusts) and place both on a floured surface. Allow the 2 balls to rise, uncovered, for 45 minutes. I made a double batch of this dough recipe, so I had 4 balls at this stage! Preheat the oven to 425-450F. (If using a pizza stone, preheat the pizza stone for 1 hour at 450-500 F and sprinkle on cornmeal onto your pizza peel) Punch out any remaining air in the dough and then begin shaping with your hands. I like to toss it in small circles over and over to get it going. 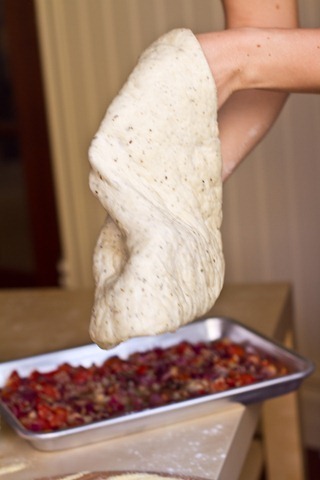 It takes a few minutes to get the dough pliable and ready to spread onto the pizza pan or stone. 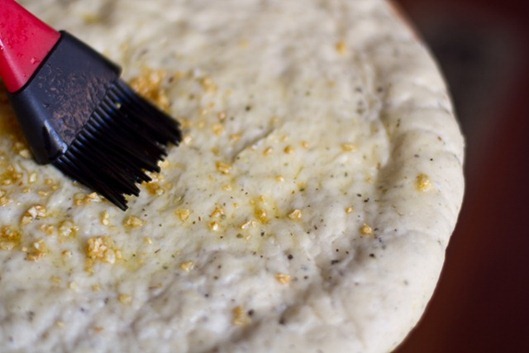 You can place your dough onto an oiled pizza pan or onto a Pizza Peel sprinkled with cornmeal if using a Pizza Stone. 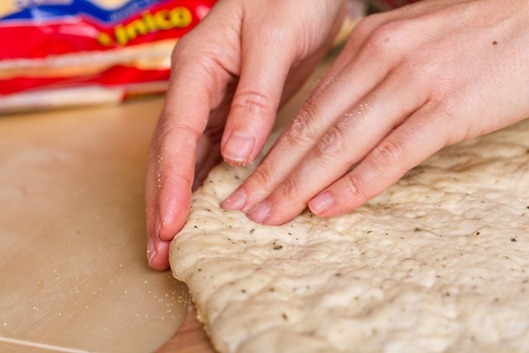 Spread out the dough with your fingers until your desired shape is achieved. Gently pinch the crust with your fingers. I like to spread on garlic infused olive oil onto the crust to give it flavour. 10) Add your sauce and toppings! Add your tomato, pesto, or BBQ sauce..and then sprinkle on your toppings! I used Daiya cheese on my section and most of the adults tried it and commented on how good this vegan cheese is. It’s a great non-dairy alternative! 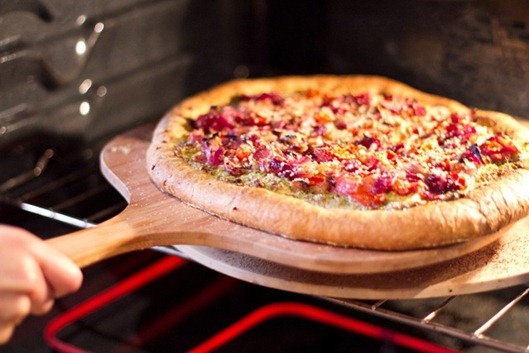 If using a pre-heated Pizza Stone, use your pizza peel to gently slide the pizza onto the stone in the oven. I highly prefer pizza stones because they give the pizza a very authentic crispy crust!! However, on Saturday night, we used pans to save time since we had 3 large and 4 mini pizzas to cook! It was just enough dough for everyone (I made a double batch). After baking for about 15 minutes, pizza perfection was achieved. Nothing to be scared of, trust me! 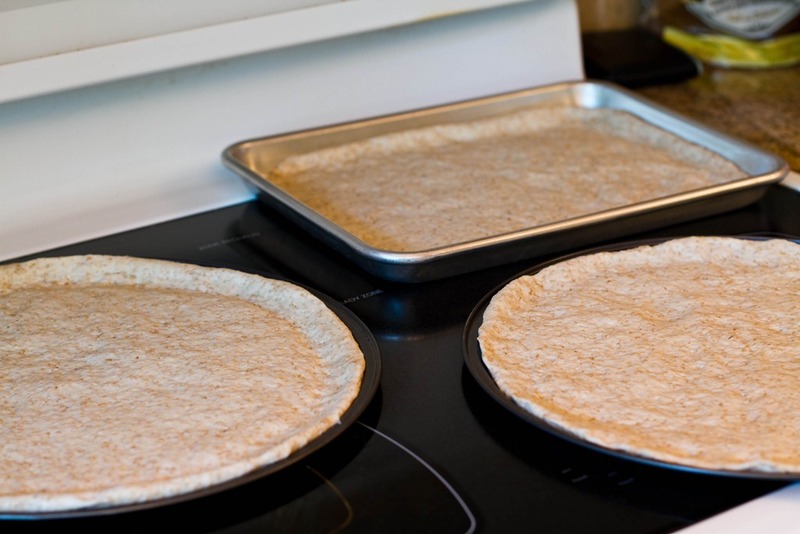 Now, go on and try your hand at your own homemade pizza crust. I’m confident you can rock it!! 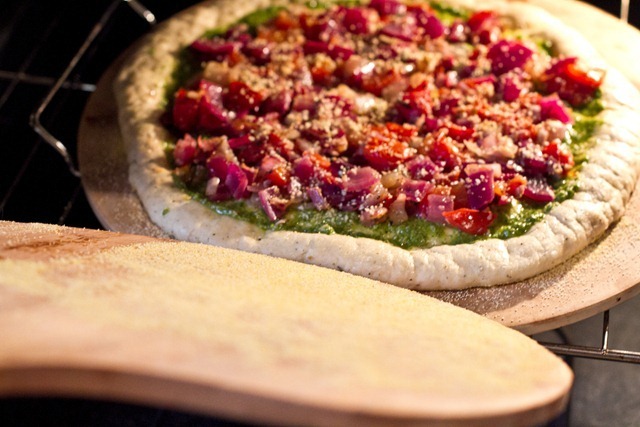 Pizza from scratch is always a crowd pleaser no matter who you are entertaining. Now who wants to come over for a pizza party? Ha! you look just like me with your laptop in the kitchen. And even more like me with wine by the laptop. Me too, wine on the counter while making the dough. By the way, your pizza dough is the best and easy to make, my kids love it. Mmmm, looks so delicious! I LOVE making my own pizza, my mom taught me how to do it when I was in high school and I’ve been making it ever since! There’s something especially rewarding about eating a pizza that you made yourself. Homemade dough makes for the BEST pizza! My dad worked in a pizzeria when he was in college so he makes the best, authentic dough….there really is nothing better! I can’t wait to try your method out! Me please!! This looks delicious Ange! I remember all of your dough trials for PFB and it looks like you’re a pro now! :) Sounds like you had a great time with your family and I’m sure they were all very well fed. I’m totally craving pizza now, and it’s only 10am! If only I could find a great gluten free mix to work with! I’ve been searching but the ones I have tried do not do pizza any justice. If anyone has found a good mix I’d love to know (comment below!). 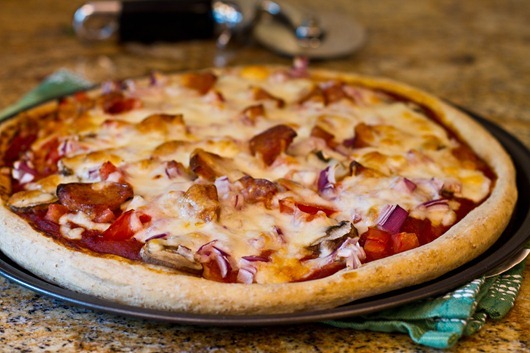 This looks so great Angela, homemade pizza brings back tons of fond childhood memories for me. 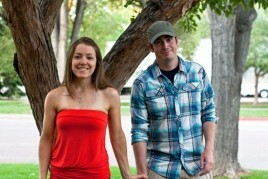 thanks for the AWESOME step-by-step instructions and beautiful photos, angela! i bet you were “auntie of the year” with the pizza party! so glad you had such a good time with your family. as a devoted auntie myself, i can appreciate how you’re feeling today – hugs! THIS IS AWESOME! I’m a huge fan of make-your-own-pizza with friends and family, but I’ve never been successful with my dough-making attempts so I’ve always just bought Trader Joe’s. Thanks for this! will have to test it out with a bottle of pinot grigio sometime :-P. love your blog btw! You make it look so easy and beautiful! Do you think it is possible to freeze pizza dough? Yes you absolutely can! I havent done it yet, but I have heard from many people who do. I, too, was scared to make my own pizza dough, but it finally came time to conquer those fears and I’m so glad I did because it was the best crust I’d ever tasted! Welcome back! The guest posts were great, but there’s nothing like the real thing! Your pizza party looks like it was a lot of fun. We have mini pizzas every Sunday, but the crusts we buy are so expensive, I would love to make a big batch of your dough and freeze it for our pizzas. Can I do that? What would be the proper storage method and how long do you think it would last? Thank you for your help!! I love homemade pizza because there is a lot more say as to what goes into it and what doesn’t. I load mine with veggies and fresh sauce and it doesn’t cost and arm and a leg!! I love making homemade pizza… But I guess I am sort of lazy and always buy the pre-made crust… the whole process of making the dough from scratch is sort-of intimating, but I am sure the flavours and textures are well worth it! congrats on conquering your pizza fears! it’s hard to imagine fearing it when they look as amazing as those though :) …. 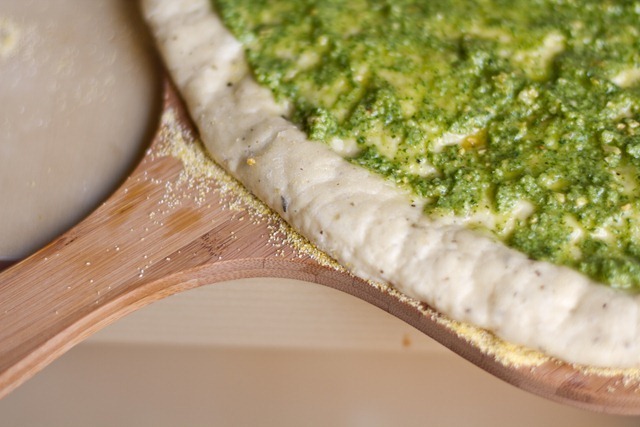 especially that pesto ‘za… looks so devine! i made your vegan pizza last night, with the roasted veggies and pesto? oh, holy, my god, YUM. that pesto is hands down the best i’ve ever had, and i’ve had (and made) a LOT of pesto. great step-by-step tutorial. ye shall not fear dough! Angela, this came at a perfect time!!! My kids want to make pizza and I said but, for obvious reasons, I want a healthy version So, I have been in pursuit of a perfect pie! Voila!! Thanks so much! I have one question: About how long did it take to complete start to finish? I just want to be able to gauge when to start in order to complete by dinner. Again, thanks so much for the MANY, MANY uber-fabulous recipes and non-food related posts. Your truly an inspiration! Due to the double rising time, (total 1 hr 45 mins), I would guess that you’d need 2 hours + 5-10 mins for the crust (without baking) but keep in mind that most of it is INACTIVE time (aka you can leave the kitchen!). Bake time is roughly 12-18 mins depending on temp and method used. I think I need to make pizza tonight..
can you make the pizza dought on one evening, then use it the next evening for dinner if it is covered and put in the fridge? I was just wondering because I could do the whole ‘let it rise for 2 hours’ thing after dinner while doing homework and then when I get home from work the next day it would only be a matter of baking it! Is there a vegan pizza topping combo that tastes yummy and doesnt involve alternate cheese? Maybe something with pesto etc? Ive heard you can keep pizza dough in the fridge for up to 5 days. I would try googling non-wheat versions of pizza dough. im sure Gluten free girl has some too! I love making homemade dough even though it’s SO time consuming – this post makes me want to go home and make a batch! That looks like the PERFECT pizza! Great step-by-step instructions..sounds more simple than I imagined…it also sounds somewhat time consuming. Did you make the pizza the same day to be enjoyed or prep the day before? Okay I always use a dough hook, so next time I’ll do it by hand! Great tip! 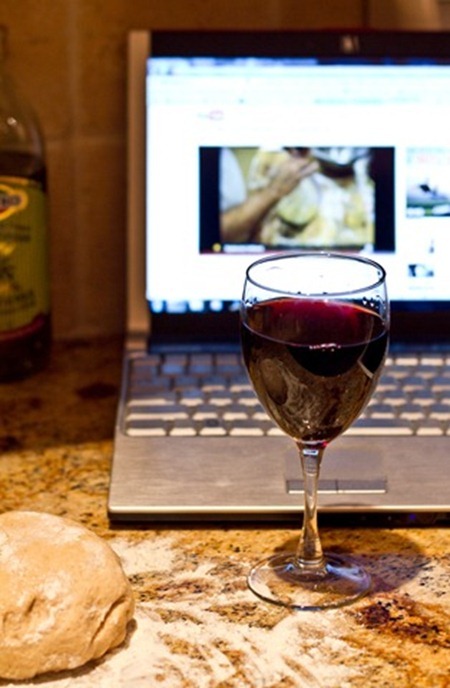 It’s all fun and games until you fry your MacBook Pro by tipping over that glass of wine. Or was that just me? Yup. Just me. I’ve been making my own pizza dough for several years and wouldn’t have it any other way. I use my dough hook on the mixer, though, so maybe one day when I have time I’ll hand-knead. I’ll try your recipe, too, and see how it does. I’d love to try the dough hook method!! 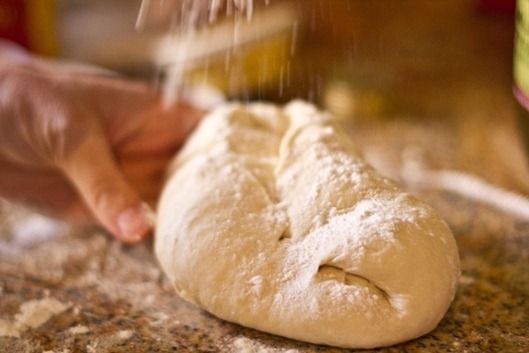 How long do you “knead” the dough this way? Thanks! Hi Aly! My recipe calls for hand kneading for 5-7 minutes, so I usually let the mixer go for 4 minutes or so until the dough starts getting wrapped up too much on the hook. I’m sure hand-kneading is better but there are only so many minutes in a day, so I let the mixer do the work. Good luck! I want to come over for a pizza party! I still have a fear of doing this, but it sounds like a worthwhile Saturday evening activity. Thanks for the tips! OMG. I wish I could have been there! I made my hubby sit through the whole event, the, um, bad tv event!! I don’t know how I got sucked into this season’s show, but somehow I did and immersed myself into the ridiculous melodrama each week, while eating vegan food!! Which guy were you rooting for?? I have to give my hubby this post as he somehow thinks that making a crust is too difficult for him, and I am too lazy to do it!! Beautiful photos, as always! JP all the way!!! From day 1, he was my pick :) What a catch! i dont know how I got sucked into it either b/c I hadnt watched since season 1! Pizza party invitation accepted! The pesto pizza looks simply amazing. It has some great colors on it! I totally agree with your verdict on the pizza stone – I just can’t have it any other way now! I’ll have to check out this dough recipe. We usually just make a white crust since the whole wheat ones we tried are so heavy, and when you’re eating pizza, you really just want a treat! But this one looks nice and soft and lovely. yea it was a perfect combo! Beautiful post as always! Your photography and great content keep me coming back again and again! 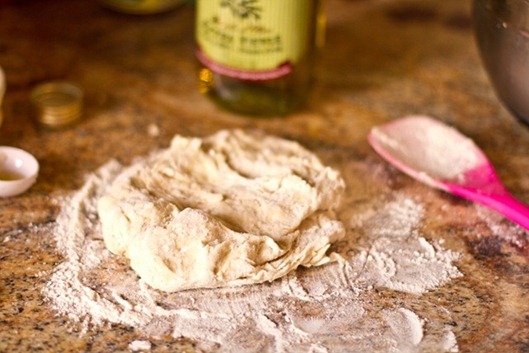 A good homemade pizza dough is hard to come by so I can’t wait to try this recipe! And apparently I should invest in a pizza stone. I totally agree that Daiya cheese is the way to go on pizza b/c it melts up so nicely! I’d love to come over for a pizza party any day! 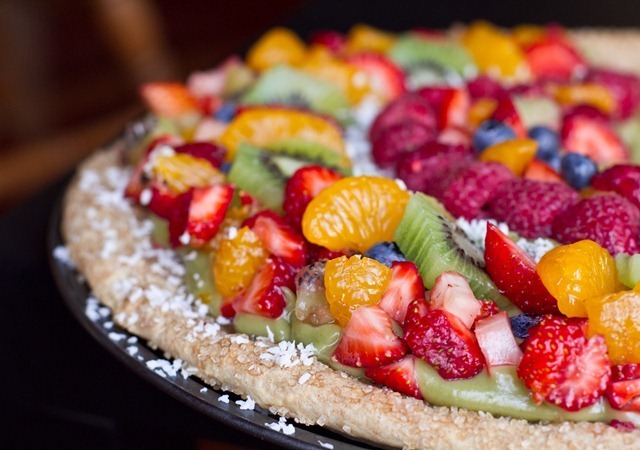 That fruit pizza is sooo beautiful! I would love to dive into that! But I admit, I am scared to make dough. Yeast, rising, precise mixtures and ingredients, kneading, rising…it all scares me like I am going to mess it up! I just love when kids are in the kitchen. 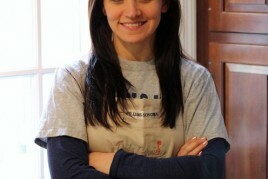 My dream is to educate kids about healthy eating and get them involved in the cooking process. It’s so much fun, it makes me feel like a little kid myself. I love to make a mess in the kitchen. I finally got a little more comfortable using yeast, but have yet to try pizza dough, it’s on my list :) Thanks for sharing! Your pictures are OUT OF THIS WORLD in this post! That takes quite the talent, my friend! What kind of camera is it that you use? I’m glad you conquered your dough fears! It doesn’t scare me, but the time consumption gets to me, so I typically make a big batch and freeze individual doughs to just pop out on rushed nights. 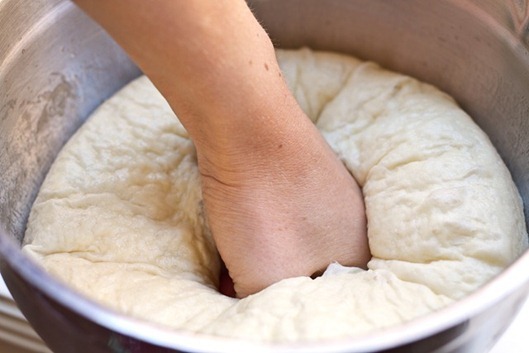 I really enjoyed this post Ange and it gave me hope that I too could make pizza dough. I saved a shortcut to this page! ;) I agree on the pizza stone. Nothing makes a pizza turn out more like ‘the real deal’. I even use it when cooking premade frozen pizzas. Once you use a stone, you never go back!! 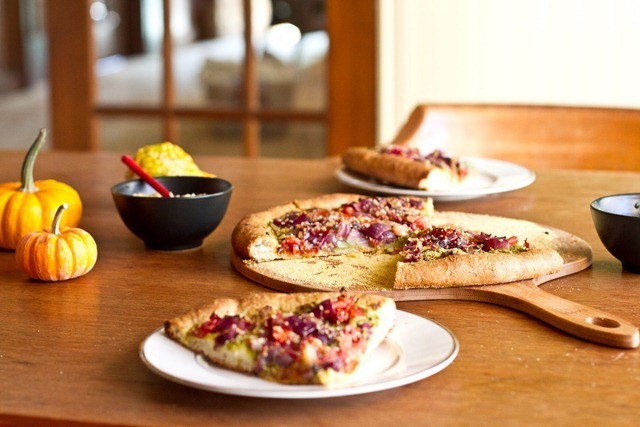 I just recently made Jenna’s ‘bbq chickpea pizza’ on my stone… to die for. hi5 sweetie. i know exactly what you are talking about when you speak of expirements in the kitchen with an apron on and a glass of wine. proud that you dug into it and glad you shared the results! Cringe! But the way that big ol’ pizza looks at the top may just coerce me out of my fear of dough/bread making. I’ve been desperate to make naan but always talk myself out of it! I’ve made it a couple times. I haven’t totally perfected it, but it’s darn tasty and vegan! I can never find vegan naan in stores, so this definitely hits the spot. My hubby is Gluten Free. Can I use a different flour and get the same results? I have had some success with “Perfect Flour Blend” by Namaste. Would this work? Thanks. PS: Just recently found this site and it is beautiful and I am loving it. Thank you so much. I would try searching for gluten free pizza dough recipes and Im sure there will be many that come up. Gluten free girl probably has one too! Angela, whenever I try to make pizza on my rectangular stone, the center always seems to come out under done and the ingredients on top get burned the longer I cook to cook the center. How do you keep the center of your pizzas cooked without the ingredients burning? I like my food charred occasionally, but I want to make a pizza without burning it at least once! Lol. Would it work if you baked it on the oven’s convection setting (if you have one that is)? That helps the heat distribute evenly…we used convection since we had 3 pizzas in at the same time! Well at least you tried right? Now you know. Same with my chocolate pizza crust. Horrid. Never again. Chocolate goes on top not in the crust, I discovered! haha well I give you props for even attempting that, I would never even think to put chocolate in a pizza! They look delicious. I have been making pizza dough for a few years but definitely have not perfected it. 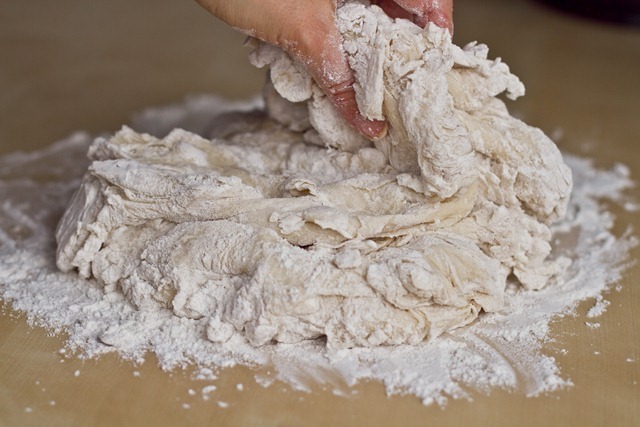 Good to hear about the dough hook as that is usually what I use – will try kneading by hand. I usually make 4-6 pizzas as we all like different kinds, often have friends join us and love leftovers for lunch! This is an every friday night thing so I really need to perfect this. One of the problems is I really do not want to use white flour. I use ww or spelt – and maybe need to add more gluten (have not done that in awhile). Thanks for the inspiration – I am excited to get on this project again! Pizza night is always a hit in our household! I agree with the hand kneading, it by far produces a superior product, plus you get in a good arm workout :) I swear by Martha’s dough recipe and in our house, the thinner the crust the better. now if only I could make a GF version that is that warm and fluffy! and of course, the wine pairing is the best part, right? YES! 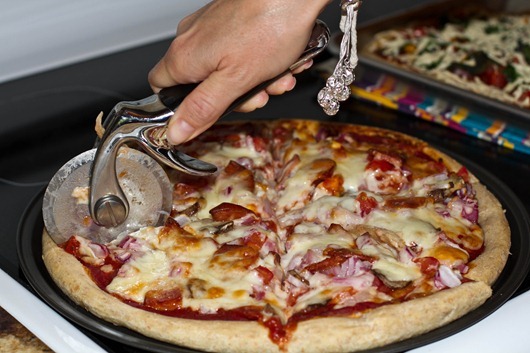 Now I have no excuse not to make pizza. I really can’t stand what I call the “fake” pizza crust that is nothing like pizzeria crust. This is perfect, thank you! I’ve never made homemade pizza dough before, and honestly, it’s all centered around fear. You make it look so easy! Definitely bookmarking this tutorial! Um, those look amazing. I have to say that I love making yeast products. My mom makes homemade bread so I was never intimidated by the process. I relish my time baking bread as I find the kneading and process incredibly therapeutic and relaxing. I wish I liked Daiya (sigh) but I do love full roasted veggie pizzas. Amazing! Thanks for the tutorial. Your crust seriously looks perrrrfect!! I always make mine long and rectangular because I can’t get that nice circle shape. :) Great tutorial post!! I’ll take the fruit pizza please! Looks delicious! My spouse and I were just discussing maing home-made pizza this week. We’ve been looking for a new dough recipe…we’ll try this one! Thanks! Us Chicago folk love our pizza! Great post and directions! That dough looks incredibly perfect! I actually came to the realization the other day that I prefer homemade pizza to any other kind (frozen, delivered, eat-in) and the dough has everything to do with it! Yummy! I’ve always been afraid of yeast too >.< I actually still am, even though I bought a tbsp of active dry yeast in a bulk store. I love how in this recipe, you don't have to wait 12 hrs or a whole day or something just to let the yeast rise but only around 2 hrs. I am bookmarking this!! Great post! I like the step by step pictures! The dough looks amazing! I’ve been reading your blog for a couple months now and am really inspired! I am a huge bread baker but always avoided making my own pizza dough until I used the recipe in Peter Reinhart’s book (The Bread Baker’s Apprentice). It’s fabulously easy to make in the stand mixer and vegan, too. I have had great results using a regular oven set to 500F. Anyway, if you’re timid about making yeasted stuff (including delicious cinnamon rolls…), I’d recommend his books. It also may be of some help to try using instant yeast–there’s no proofing involved and it makes this faster and more reliable, too! Did you really use only vegan cheese?? 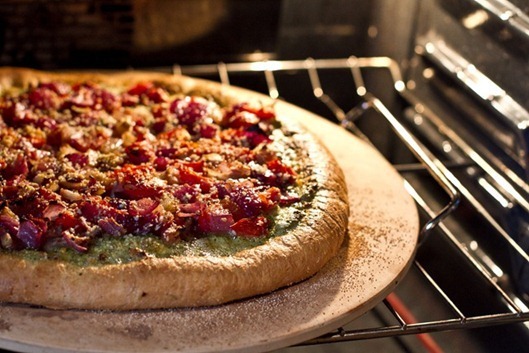 Did you use the brand Daiya, in the pizza you made on Saturday night as well (as pictured above) ? The image at the bottom is with the regular cheese. Daiya doesnt melt as much as reg cheese does, but it comes close enough that I dont mind. Delicious looking! I have great pizza restaurant in town, and they let me bring my own Daiya that they add to my pizza. Therefore, my incentive to try making dough has been low. I have always been scared to venture into bread making. Perhaps now is the time to give it a try. Your pizzas always look so great! 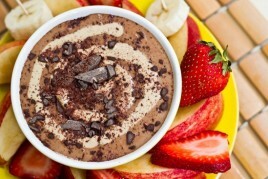 I have used the one you posted for the FoodBuzz competition several times. It works really well for me, but I usually have a hard time getting the dough spread out in the pan. My dough always seems to spread out and then shrink back. Has this ever happened to you or do you have any ideas what could be causing it? Maybe I’m not kneading it long enough? I make pizza at least once per week with homemade dough. I have a MAJOR crush on pizza with hummus as the base, and not cheese (just load it with veggies)… promise it will change your life! I made a hummus appetizer pizza! SO GOOD! This is exactly what I’ve needed!! Thanks! I would love to make my pizza. We ordered pizza from the “authentic” Italian pizza restaurant and it was not what I expected it to be. I guess there is just so much advantage in building you own pizza because you can put everything in it you like. Baking anything with yeast always intimidates me, but you give a great tutorial! I have always wanted to make pizza dough! I actually prefer the taste of whole wheat but its very similar! Okay now that I have a step by step tutorial I have no excuse NOT to do it! Wow…that’s a very detailed look at the process. Thank you. I’ll give it a try! I’m so glad you had a fun time with your family visiting! 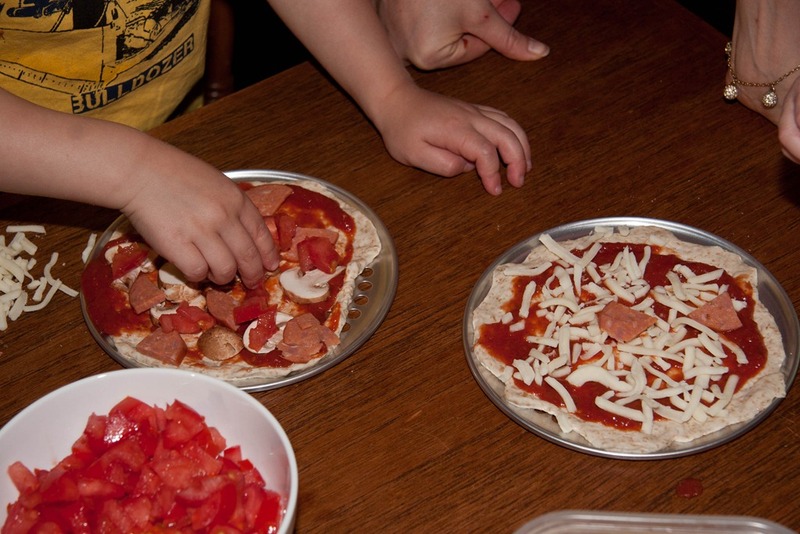 I have the best memories of making pizza with my family ever since I was little! I’m determined to eventually have my own wood-fire pizza oven, haha! m not sure what brand it is or where it’s from…I’ll try to take a look! Yeah, I haven’t watched it in years either but I was for JP too. Hubby thought he was “possessive” but I thought he was a little older and of course he is possessive with all those other guys around! He seemed much less “metrosexual” pretty boy than the others. I prefer flannel shirts to hair with product. Too funny. haha yes he’s def. possessive, so hopefully that wont be an issue in their relationship down the road! This looks incredible. I love the action shots of the dough making in progress! The toppings… oh the toppings… mmmm! What did you put on the pizza that has the green sauce? Is that pesto and tomatoes? Anyway, it looks delish and I would very much like to try it! This looked so yummy when I saw it yesterday that I knew what was for dinner…pizza! I also loved the idea of pesto, so whipped some up and used it as the sauce base. Thanks for the recipe! The crust turned out perfect, crisp and yet still soft :) With the added bonus that it makes two pizzas, leftovers! Glad you enjoyed it Liana! I used to use my bread machine before it died and it always came out perfect! Since then, I’ve only made it once or twice for calzones. I’ve been so wanting to have a build your own pizza party, but every weekend seems to get too busy! I saw another post today about making pizza at home and now it is going to have to be on my must-do-now list!! do you know if you can freeze or refrigerate the dough you don’t use? And for how long? Love the pesto pizza. We’ve made it twice already and its my favorite! 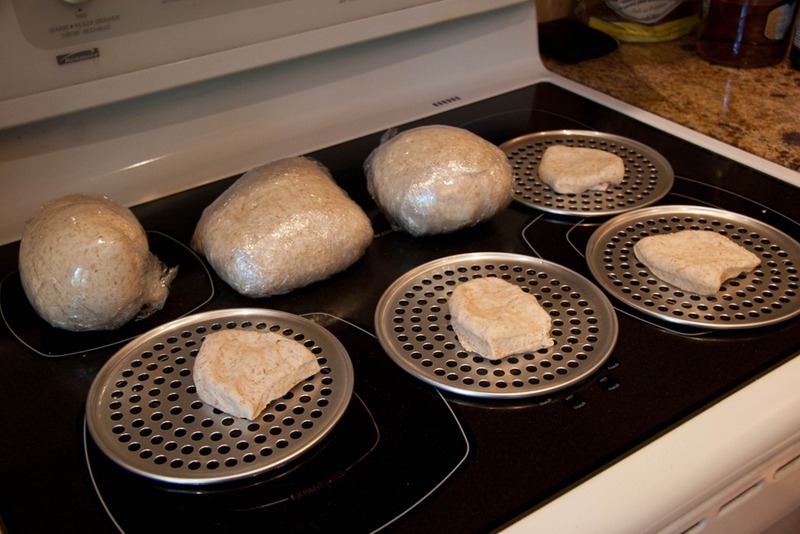 I know many people freeze pizza dough, I would try googling it as Im not sure on the specifics. 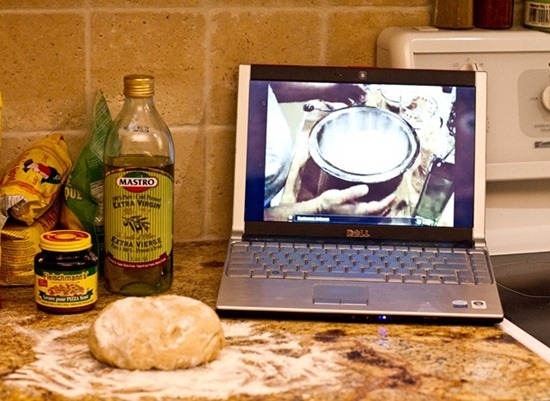 I’m glad you posted this- you have me believing I can make great pizza crust from scratch:-). Wow Angela, these pizzas look pro! I too have a fear of using yeast (except in cinnamon buns, which always seem to turn out for me). I have tried making homemade pizza dough several times, never with great success, but I’m definitely going to try this recipe. Love the fruit pizza at the end – what a pizza feast! I think it would be quite dense if using all whole wheat flour….let me know if you try it out though! 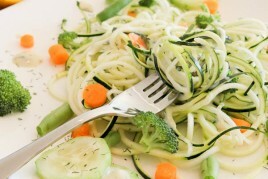 This looks so good and so easy that I am sharing it with my team on Sparkpeople.com! Oh, I know exactly what you mean about sometimes needing a glass of wine to help you find your groove. If I pour a glass and put some good music on things just seem to flow a little better (my favourite part about making pizza dough is punching it down. So satisfying). Next, if you haven’t already, make sure to try grilling your homemade pizza! If you’re a fan of the pizza stone, you’ll probably like this. My usual route is to roll/pat out dough in a manageable size (divided into personal-sized lumps), brush some olive oil on one side, and put oil-side down on the heated grill. 3-4 min later (depending on temp), pull it off, spread sauce/toppings on the grilled side and put back on the grill until heated thru/cheese melted if applicable. Enjoy! I made pizza last night, and it was a bit of a fail. I’ve made dough in the past and had success, but I tried a different combination of flours (as suggested by a customer at work), and I knew once I started kneading it probably wouldn’t turn out as planned. I cooked it up anyways, and we ate it, but I won’t be doing that again. I almost feel like I need to make pizza again just to erase that bad pizza dough experience! What type of flour did you use? 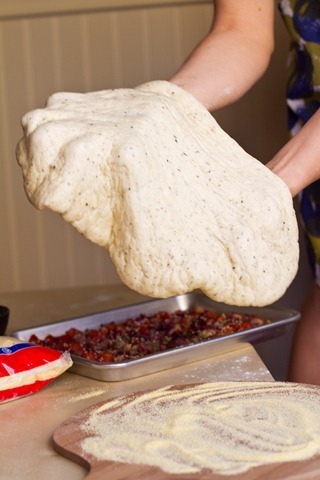 Or did you add spices to your dough? I can see flakes in your dough that I don’t have. This pizza was amazing! I’m definitely making it again!!! Hey Tina, I’m glad to hear you enjoyed the pizza, thanks for letting me know! I love love pizza. I love finding new pizza recipes and trying them out. My husband does not like pizza as much as I do, So I only make it when I know he is not hungry or out of town. I love your blog , I will definitly have to bookmark this page. Thanks Thanks this page is making me hungry!! Hey Angela! Just wondering if this pizza dough is vegan?! I made it last night and it was soooooo good, but i’m just newly vegan (only a little over a month) and only thought about it after that the yeast is probably not vegan and i’m a little freaked out?! haha Guess we cant all be perfect. Hey Megan, Yup yeast is vegan. :) Thanks for your kind words about my blog! Goodluck to you. Thank you so much. I reference this page every time I make a homemade pizza now! Looks relish! Have you ever made cauliflower pizza crust? A friend’s mom made this a few times using riced cauliflower, mozzarella cheese and eggs. If so do you have your own version of the recipe you can share? Maybe sub mozzarella for almond cheese? Not sure how to get around the eggs though. No I havent but Ive been wanting to try one! Thanks for the reminder. Can the dough be frozen for future use? If so at what point do you freeze it? Before or after rising? Hi Kristen, I do think you can freeze pizza dough, but I’m not exactly sure when you would freeze it so I’m hesitant to give you a suggestion – I would suggest a quick google search about freezing dough. You should be able to find someone who has the proper advice. Goodluck! I can’t wait to try this crust as is but do have a question in regards to flour substitute. I’ve been reading up on almond flour and I know it can’t always be substituted 1:1 to all recipes as it does not absorb liquids as well as wheat or white flour. Do you have any suggestions for subbing out the wheat and white with almond flour in this recipe? I made FIVE of your recipes today, (all great!) and this was one of them – the pictures really helped. I topped my kids’ with the usual tomato sauce and mozzarella, but I put your cauliflower Alfredo sauce (with a little cashew creme mixed in) on mine, and then layered on roasted squash and a few dollops of tomato sauce. When it came out of the oven I drizzled on some black truffle oil – wowza! I already make my own pizza dough… well I did when I was vegetarian (used honey) and I recently crossed over to the vegan side :D so I decided to look for a brand new pizza dough recipe. I came straight to your website. You’ve been a vegan goddess for me!! lol just curious, what are the toppings in the picture where you’re cutting the pizza? It looks AMAZING. I made this pizza dough the first time about 3 weeks ago, let it sit overnight in the refrigerator, and then divided my dough into 2 parts. We made pizza that night, and froze the other part. The results were great. Part 2 of the great pizza “science experiment”: Yesterday about noon, I removed the frozen dough from the freezer to the refrigerator. Then today about 1:00 PM I took it out of the refrigerator and into the (unheated) oven with the light on. The dough rose again (3rd rise), and then we made pizza. Then you flatten it all out to make the pizza and it puffed up again while cooking. I swear tonight’s pizza was as good or better than the first one. And I had a whole lot less to clean up tonight! Could you freeze any leftover dough? Hi. You need to cold proof the dough in the refrigerator for 3 days prior to baking. 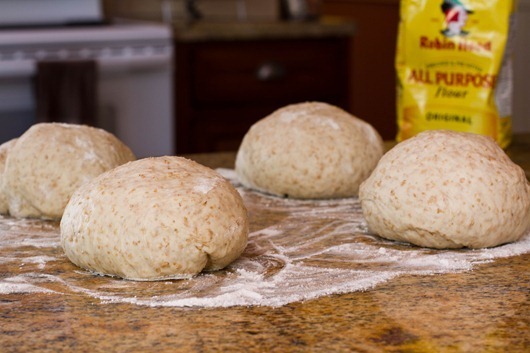 Your method will result in dough with minimal flavor. Also don’t use a pizza stone. Instead use a steel or better blue steel pan baking at 500 degrees for 8 to 12 minutes. Steel is a better conductor of heat than stone. Also use a high gluten flour. I would like to buy a stand mixer in India. Please answer my questions. Can I make this pizza without any stand mixer? Could you please suggest the company? Which stand mixer is better? Where to buy this stand mixer in India? Can I buy through their official website? If I can buy, please suggest me their official website in India. This recipe looks yummy. I don’t own a pizza stone, however I used a cast iron skillet well oiled, and seasoned. I also knead in cornmeal and extra on the bottom. I prebake for 5-8 minutes then top. It makes a delightful pan pizza that can be topped to the edge. Thank you for the recipe. I will be trying this on the weekend. Thanks for sharing the cast iron skillet trick, Kim! I hope you like this recipe when you give it a try. I will try making pizza the first time with my kids this weekend. Thank you for sharing the recipe! It’s very helpful for me!